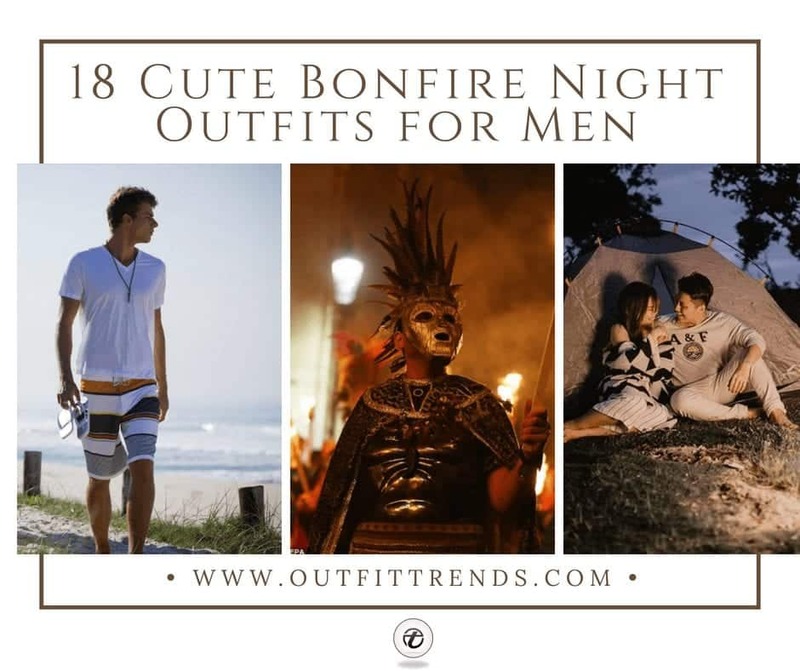 Bonfire Night Outfits for Men: Even though the tradition of bonfire night and celebrations took its root from the famous and notorious gunpowder plot by Guy Fawkes, but it has become popular and various celebrations like weddings are now being held with the theme of the bonfire. Bonfire parties and nights are a fun way to celebrate a special occasion where friend and family come together to enjoy a roaring fire display and great food. We have created a great guide here for how you can dress up for bonfire night and parties and look dapper. Don’t dress too formally or overload yourself with unnecessary layers of clothing. Avoid wearing synthetic fibers because even though they catch longer to burn but they tend to melt on your skin. Keep a raincoat with you in case it does rain. It can be a tad bit tricky to pull out the perfect look for a bonfire party, depending on your venue and the weather which can swiftly change and make you feel uncomfortable. But bonfire night is all about dressing up in cozy outfits because you might be there for quite some time. Have a look at these 20 Ideas What to Wear for a Road Trip. Winter bonfire means not only taking a large sip of your mulled wine but also preparing for the cold weather conditions. This means layering up and donning the essential warm pieces of clothing you have with that extra padding. Start with a crewneck sweater and you have a million options to choose from ranging from hoodies to jackets and overcoats. For legwear, you can opt for warm sweatpants, chinos or jeans. Wear your favorite pair of sneakers or trainers and you are good to go. Keep a beanie to keep yourself adequately warmed. If it is summer time, you can easily relax and opt for various options of clothing. Starting from the simple crew neck graphic shirt with jeans combo to a more dressed up look with either plaid or gingham shirts or dress shirts and polo shirts. You can wear bright colored pants or shorts for adding some summer fun to your wardrobe. For a more dressed up look, wear chukka boots and for a casual fun look go for sandals. How you dress up for bonfire night or parties depends upon the society you belong to. Check out these 20 Stylish Men’s Outfits Combinations with Shorts. Go for a spunky look, go with a tribal pattern shirt or hoodie. More often than not, the weather tends to go towards a chilly side. For this kind of shift, the best and one of the most modern piece of clothing you can sport is a poncho. A poncho not only wraps itself comfortably around you but also gives you a very classic look and can be worn with any outfit. Beach bonfires are all about drinking in the sight of the sea and the sun and enjoying with a roaring bonfire. Whether you are lounging lazily or plan to surf and roam about, go for the standard look with either a tee and jeans combo or tee and shorts combo. In your teenage years, you are still young and can go with various different outfit options from your normal tees to varsity shirts and from distressed to acid washed jeans or sweatpants. Go for easy slip-on trainers or flip-flop for comfortable footwear. A late night bonfire celebration means you have to dress in something that is not only very comfortable but also snug and safe. For tepid to normal weather conditions, a crew neck shirt or hoodie with shorts will be fine. For cooler nights, stock yourself with the right cardigan or jacket along with jeans or chinos. Here are 24 Best Boating Outfits for Men. Dress to impress takes literal meaning and more significance when you are going for a bonfire date. A clean-cut beige blazer with V-neck shirt and jeans gives you a great casual sophisticated look. For a more relaxed date night, you can dress up in crew neck graphic sweater and jeans. For a smarter look, go for a versatile blue dress shirt which will go well with a cardigan or jumper. Pair it with khaki or chinos and wear dark leather chukka boots for a great look. What’s more comfortable than wearing a shirt jacket with or sans a tee for an evening out in front of a bonfire? Team it up with jeans and boots or sneakers. If you are having a bonfire party in your backyard, you can dress up in full sleeves shirt and jeans combo in the evening and for nightwear, you can choose shawl collar cardigan and wear it over evening ensemble for a more dignified look. While at a bonfire party, the weather can grow to be chilly or if worst come to worst, it might even rain. Prepare for this beforehand and carry a rainproof jacket with you. Have a look at these 22 Ways To Wear Shearling Jacket. Quilted Jacket will not only be super cozy but will also provide a great texture option. Pair it up with jeans for a great look at a bonfire party. You can sport a more formal or dressed up look by wearing a full-sleeves gingham shirt which is very popular this season, and don a beige or off-white jacket over it for winter. For a more casual and laid-back look, go for a crewneck shirt or Plaid shirt with a denim jacket. If you plan to go out for bonfire parties in winter, carrying a woolen or cashmere scarf is mandatory because you never know when you will start feeling cold. You can choose to wear a beanie or a simple varsity cap depending on the time of the season and the venue. For bonfire in morning or evenings, keep your sunglasses with you. You can always wear printed or bright colored sneakers or trainers to add a little fun and twist to your overall look. These are cool for every guy!